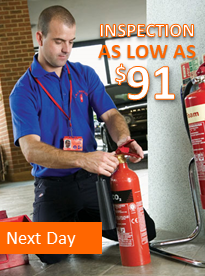 We will send a licensed technician to your location to perform a fire extinguisher inspection the next business day. This annual inspection is completed in accordance with applicable code in your city and state. When the inspection is completed there could be recommendations for corrective action; otherwise, the extinguisher will be given a compliance tag. Schedule Online Or Call (888) 627-9394.